As our CES 2016 tour rolls on, we stopped by Deepcool‘s suite for a look at their new Genome liquid-cooled case. 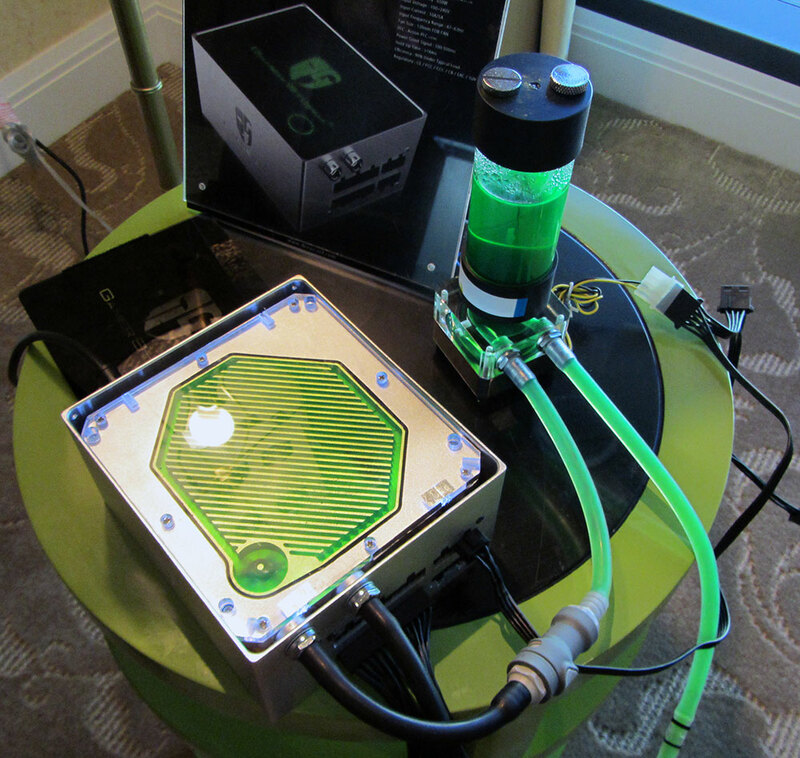 They also had some other products on display like a liquid-cooled power supply prototype and a new entry-level case. The highlight was definitely Deepcool’s Genome case with a pre-installed water cooling system. Many PC enthusiasts are not comfortable installing their own water cooling, so Deepcool made it easy by pre-installing the water cooling loop into the case. The Genome’s cooling solution includes a 360mm radiator, three PWM fans and a reservoir on the front of the case with a helix. As you can see from the photos, the design is quite unique, but can be integrated into various color schemes (see the white case build for a great example). Another trend we’ve seen time and time again at CES this year, as least in case mods, are vertically-mounted graphics cards. Although the Genome does not come with a PCIe extension cable, it does offer a vertical mounting solution for GPUs to enhance the look of your build. For the extra long video card, there is a removable portion of the case’s main “cage” (towards the front of the case) for some extra room. Other features include a side window, dust filter and anti-vibration rubber feet for the PSU, cable pass-throughs, and USB 3.0 ports on top. The Genome will be available in a few weeks with an MSRP of $249.99. We hope to have a review for you, so stay tuned. Another liquid-cooled product on display was a power supply prototype. Although not typically requiring extreme cooling, this 650w 80Plus Gold modular unit had a water block covering the internal power bits and barbs at the rear for easy installation of the loop. Tubing, pump and reservoir are not included. Deepcool is still working through details and gauging interest before deciding to bring this product to market. Seems like overkill to me, but share your thoughts in the comments. The photo below shows the PSU’s “waterblock,” there is a semi-transparent branded cover that goes over it when installed in an actual PC. Last up was an entry-level case with a $70 MSRP featuring a side window, independent SSD mounts, fan controller and a magnetic front door. As the entry-level case gets closer to launch, I expect to have more details as well as a review. Keep glued to Overclockers.com for more CES coverage.